Pineapple Salsa. 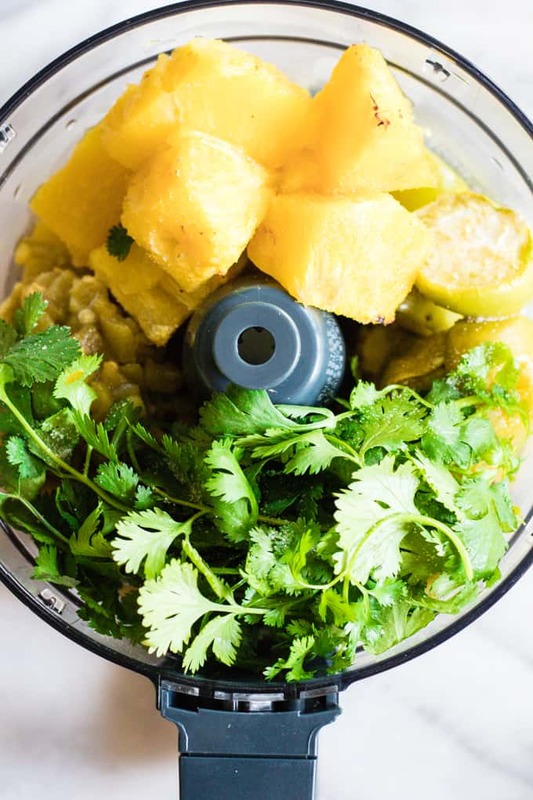 This blender salsa is loaded up with fresh pineapple, tomatillos, jalapeno, and cilantro. 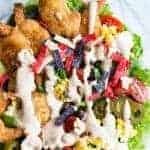 It’s bursting with a fresh, sweet and spicy flavor that is perfect when paired with chicken or fish. 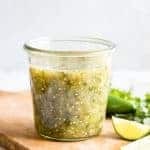 This is a blender salsa, meaning that we will make it in either a blender or a food processor (affiliate link). 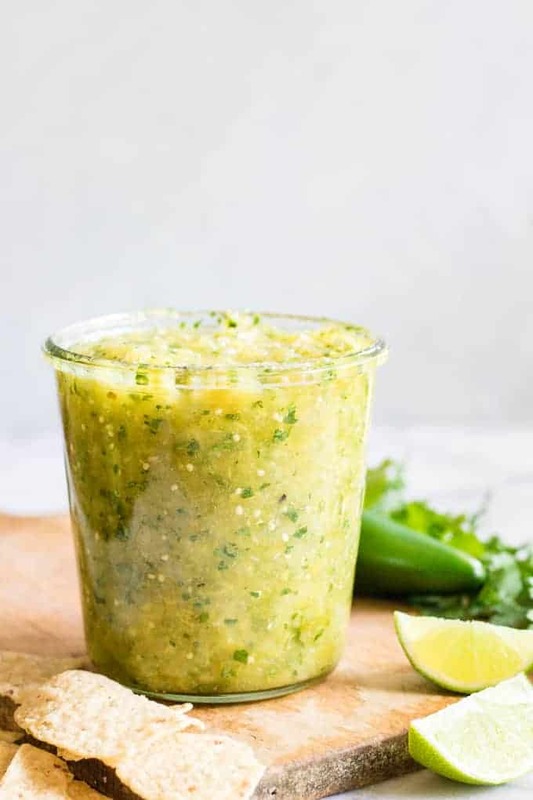 It gives a blended salsa mixture, similar to that you would buy at a market. Perfect for dipping chips into, or spooning on tacos, chicken or fish. First we will roast the pineapple, jalapeno, onion and tomatillos in the oven under the broiler. This softens up the tomatillos and jalapeno, and gives a lovely flavor to our pineapple salsa. Then it’s just a matter of putting the ingredients into our processor or blender to blend it all together. 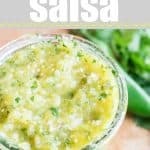 What to serve with this pineapple salsa? This pineapple salsa has a sweet heat to it. With the pineapple it has a fruity, tropical sweetness. 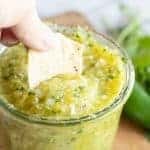 If you’re wondering what is the best salsa to use on fish? This is the salsa for you! 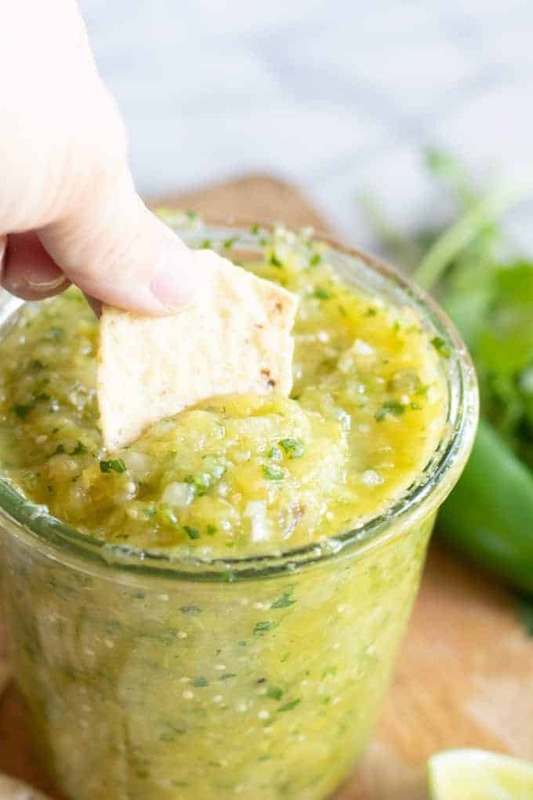 This salsa is great for dipping chips into. Spooning onto some chili lime chicken (or any chicken really..). Spooning onto some fish tacos, or some baked or grilled fish. Or even enjoying with some shrimp. It’s the perfect summertime salsa recipe. Always cook your tomatillos prior to using in salsa. In this recipe we are roasting them. If you prefer to use the stovetop you can also boil them, which is the method used in the salsa verde recipe. Customize! One of the best things about making your own homemade salsa is that you can customize the flavorings and the heat. You can always use a different pepper instead of jalapeno. Some other options would be a Serrano pepper or an Anaheim pepper. 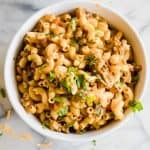 You may also opt to use less or more lime juice, salt, cilantro. The water is to thin it out, use as much or as little as you need. 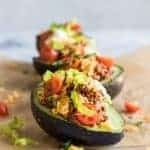 Due to there not being ingredients that create a lot of juice such as regular salsa using red tomatoes, this recipe calls for water to thin it out. Once you blend the ingredients you will notice that the salsa is rather thick. Which makes it difficult to dip chips into. So add the water, as much as needed to get the consistency you prefer. 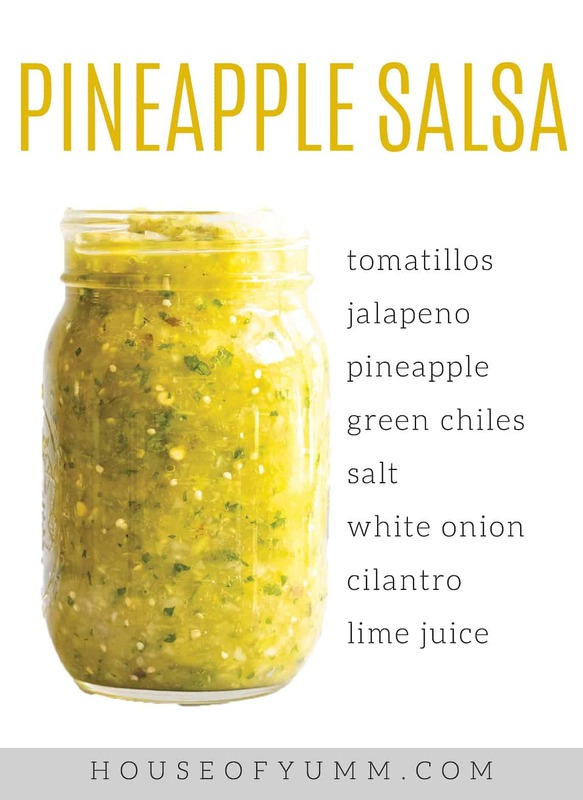 WANT TO TRY THIS PINEAPPLE SALSA? Line a large baking sheet with foil. Spread the chopped tomatillos, jalapeno, pineapple, and onion on the baking sheet. Place under the broiler and bake for about 10 minutes. 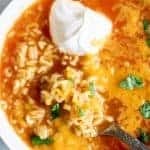 Add all ingredients to food processor (affiliate link) and pulse for about 30 seconds until all ingredients are combined and no large chunks remain. Store in a sealed container in the refrigerator. Serve cold. Can be stored for up to 2 weeks. Hi Ann! I’m so glad you like the recipe. And no, this salsa needs to be stored in the fridge to keep it fresh.